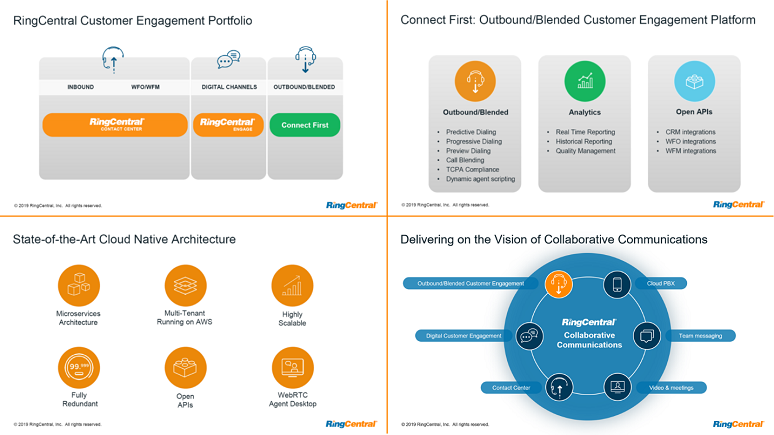 On Monday, RingCentral announced that it has entered into an agreement to acquire privately held Connect First, a cloud-based outbound/blended customer engagement platform. As in the case of its October 2018 acquisition of Dimelo, the company didn't share financial details except to say that it estimates the acquisition will have no material financial impact for the year ending Dec. 31, 2019. Using the slides below as a framework, yesterday I spoke with RingCentral’s Jim Dvorkin, senior vice president, Customer Engagement, and John Finch, vice president of contact center product marketing, as well as Geoffrey Mina, CEO and founder of Connect First, about the announcement. One of the first questions that I had, as did the first commenter on my LinkedIn post about the announcement, was about how the Connect First acquisition would impact the relationship RingCentral has with NICE inContact for delivery of RingCentral Contact Center. As you can see in the slide on the upper left, the NICE inContact-based RingCentral Contact Center will continue to be the primary option for inbound and workforce optimization customer needs. RingCentral Engage, which is the former Dimelo solution, will be the solution for digital channels (e.g., email, chat, social media); and Connect First will be the solution for customers with outbound and blended-solution requirements. When I asked if RingCentral has a plan to integrate the Connect First and NICE inContact platforms, or if in fact such an integration already exists, I learned from Dvorkin that “the initial priority will be to integrate the Connect First platform with RingCentral Office: the underlying voice platform, single sign-on, and a common user directory.” Next, he said, “we see a great opportunity to integrate Connect First with RingCentral Engage, and leverage the digital channels together with the outbound and blended technology.” RingCentral will focus its time and attention on these two areas. The slide on the upper right gives an overview of Connect First platform capabilities, not just predictive dialing but preview and progressive modes as well. I asked Mina about the history of Connect First, a solution conceived in 2005 and deployed a year later. Was Connect First designed for a specific customer, and then productized, or did Mina have a vision for a cloud-based business on his previous experience at contact center company Prosodie, now part of Capgemini? A little bit of both, he responded. In 2004-2005, Prosodie was beginning to move into the contact center-as-a-service (CCaaS) space, Mina said. While working on some large-scale deployments with Prosodie e-commerce customers, Mina said he saw microservices architecture, with its inherent scalability and uptime, as the underpinning of e-commerce expansion and saw an opportunity to apply the concepts of modern Web stacks to contact center and create something differentiated. At the same time, he and his co-founders were also having conversations with two business process outsourcers. With no firm commitment, they said, “That sounds great. if you guys build this, we'll shake hands and promise to be your customer.” Mina called it a gentleman’s agreement to have early revenue and went ahead. Which leads us to the lower-left slide. What RingCentral is acquiring is a voice-based, outbound/blended contact center solution based on a highly scalable microservices architecture. Initially, Connect First software ran in a data center environment but moved to AWS about four and a half years ago, Mina said. Most firms that start in data centers have considerable work to move to a public cloud, but not Connect First. “Based on the flexibility and architecture of our technology stack, that migration was incredibly simple for us,” Mina said. And once Connect First was on AWS, its DevOps team was able to take advantage of the technology stack that Amazon brings to continue to innovate on the technology and bring higher scalability, high reliability, and more geographic redundancy, he added. Finch wrapped up the call by showing the lower-right slide, saying that Connect First completes the RingCentral portfolio. I cautioned him not to say RingCentral was done too soon -- there’s certainly room on that slide to add one or more jewels to the ring! RingCentral will be joining a panel in the Contact Center & Customer Experience track at Enterprise Connect 2019, March 18 to 21 in Orlando, Fla: “Cloud Contact Center Faceoff." Plan to join us! Register by Friday, Jan. 18, to receive the Advance Rate -- and as a No Jitter reader you can use the code NJPOSTS to save an extra $200.